Today I want to share a story of perspective. Working title: "The day Kyle developed a fear of ladders." Kyle's family came in this weekend to help with more home improvement projects. 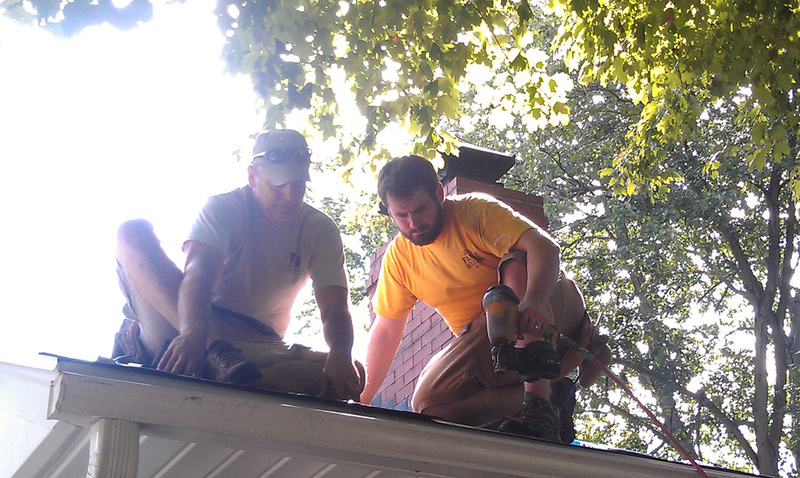 His mom landscaped while Kyle and his dad put a new roof on the house while I, umm, cheered them on. Sunday morning I was still waking up when I heard a scream on the deck. I ran to the door and saw my husband lying flat on his back on top of the ladder. As Kyle was making the transition from the ladder to the roof, the ladder slipped on the still-dewy deck. As the ladder slid, Kyle's legs slipped through the rungs and he fell backwards, him on the ladder, the ladder on his ankles. Looking back, I didn't really react the way I thought I would. I didn't run to him. I didn't start crying. Since I didn't see it happen, I was still in a state of confusion as to what was happening. I very much take my cues from Kyle when it comes to worry and panic. He tends to be more rational and level-headed than I am. I figure if he's not worried then I guess I probably shouldn't either. I think this was what I was trying to do when I saw him not moving on the deck -- just trying to stay calm so he wouldn't worry. I heard him say "I'm ok" and then slowly start to move his head and his legs and arms. He laid there a while before being able to stand. Slowly throughout the day the bruises started to appear, with a huge and horrible bruise in the perfect shape of a ladder rung on his lower back. Even though he's perfectly fine and escaped with just a few scrapes, I still find myself thinking about the "what if's." I could have lost him. For me, it's a story of perspective. Of how quickly things can and do change. It's a story that helps me understand just how deep my love for my husband runs. It's a story of just how fragile we are, our relationships are, our lives are. And it's a story of how trusting in the Lord is all we can do in this life. His will reigns. His plans are supreme. Nothing is outside of this. Gosh, I'm getting goosebumps just reliving it again. Have you ever had one of these stories? Those times when things are thrown into perspective in such big and powerful ways? Oh this story got me. Perspective is huge. I have my own story. I learned a lot about myself and my faith the day my 2nd daughter was born. It's a long story, but after you have your baby, and if you want to know I'l tell you. The simple truth is that I learned that God's plan is out of my control, and at the end of it He is always there. I'm glad your husband is ok, thanks for the perspective.